As if I didn't have enough to do what with a really busy work schedule and potentially moving house before Christmas, the boy quicksilverwhistle, enrolled himself onto a stone carving course this weekend, at Tom Clark's premises, in Martock, Somerset. His website is here. Actually I'd enrolled myself on this course at the end of July this year after a very difficult and deeply unhappy period in my personal life, which was alluded to in another blog at the time. But I'm not downbeat for long and booking myself onto this course provided a much needed focus for the dark days of November and a respite from Christmas shopping. Mind you I've not done this either yet. Little did I know that come November 2009, I'd have my house sold in 13 days from putting it on the market, be in the middle of a frantic period at work, and well running backwards just to stand still. So this weekend came as a genuine breath of fresh air away from packing socks in preparation for the off.........and well only panicking slightly!! This weekend, as most of November has been was dreadful in terms of weather. It just never stopped raining, and I don't mean normal rain, stair rods. Anyway Friday came and I had no idea what I was going to carve, so after a chat with Tom on the phone on Friday evening did a bit of interworm surfing and found this piece of jewellery, from a New Zealand site, which I thought oh I like that I'll take that as inspiration. So duly through the monsoon I drove on Saturday morning and arrived prompt and early at the studio. Now I'm quite artistic, but I've never ever touched a stone chisel or dummy (the hammer bit) in my life so I had absolutely no idea what I was letting myself in for. There were 6 of us on the course, himself, a couple from Kent, a father and son combo from Cheltenham and a woman from Bristol, who it later turned out was a best friend of a work colleague of mine. 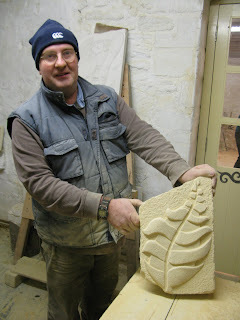 Small world indeed this stone carving business. Smashing, just enough to have a great weekend.... and we did just that, they were a really friendly bunch. Loved it. After the preliminary what we're going to do and so on, Tom set us to work with a block of stone, which in my case was Bath stone. It's quite daunting being a complete beginner in a studio environment, because one never knows what fellow course attendees are capable of. Visions of making a bag of sand and gravel appeared in my mind. 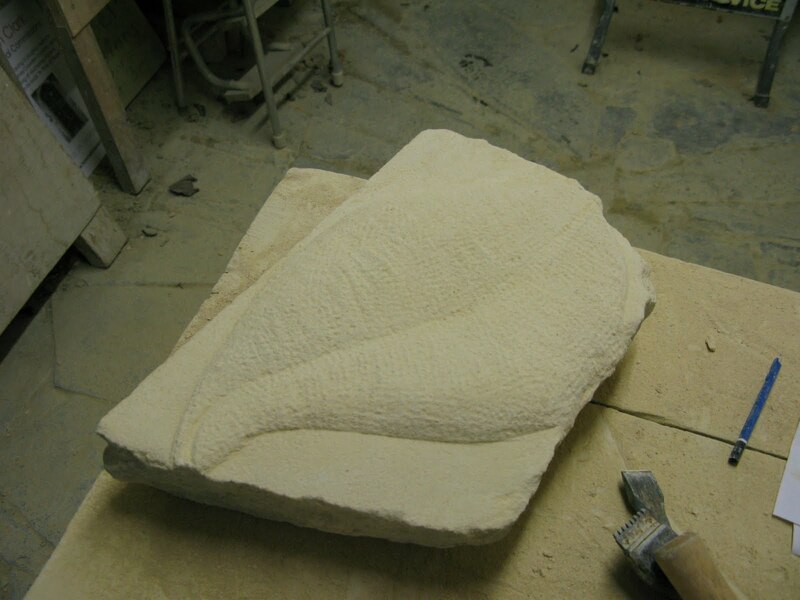 But never fear I bashed away to Tom's instructions so that by lunchtime (after a brief stop for tea and very acceptable home made biscuits), the lump of stone was coming into shape. Lunch was over and so the shape needed to be made into more of a shape. I have to admit here to being the only one mad enough to work outside this weekend, which was refreshing in a way, open at one side to the elements and the pitta patter of rain. Everyone else was indoors, cosy fire roaring away, lovely and warm. But I am a Geordie. I know how to suffer for my art!!!!! The scene of this frenzied Activity!!! Bash bash bash I went as the afternoon became night, and the darkness gathered pace. The bashing was alleviated a bit by a photographer from 'Discover Somerset' who popped in to take some photo's of activities in the area. He took lots of me, probably because I was the only one covered in dust, then disappeared indoors to take some of the proper carvers. 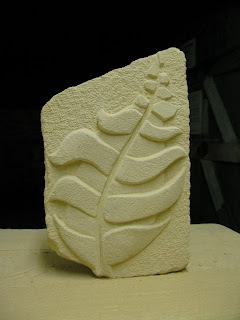 All very exciting, but once that was over, more bash bash bash and and by 5pm on Saturday evening I had a lump of rock which had a sort of leaf shape on it. Hey not bad. I think I'll stop here.... I'm bound to ruin it if I carry on!! 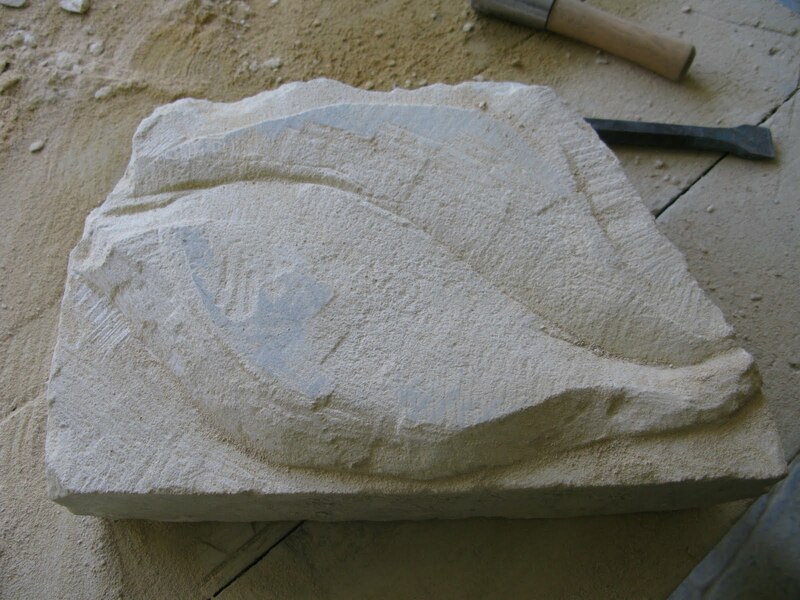 So here ended the first day - 7 hours of bashing a bit of limestone with a hammer and chisel and this was the result. Tom's tuition was spot on, basically do all the preparation now and get the basic leaf shape perfect before I begin to cut out the pattern. I was exhausted, covered in dust and ready for m'tea. (Though we did have a wonderful lunch provided by Tom's wife).... and so to bed!! Sunday morning. It was raining even harder as I drove from my overnight accommodation through the flooded lanes of Somerset. Absolutely awful. I was also aching. 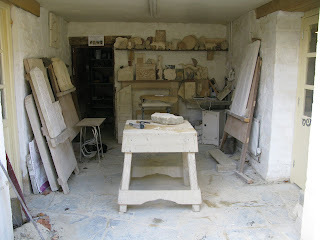 How can standing in one spot, bashing a little chisel and not doing a lot be so exhausting and make one ache so much? Middle age has nowt to recommend it. But first task, mark out the basic pattern above. 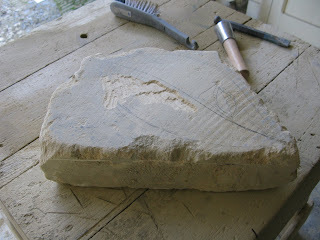 And now the scary part, chiseling away the stone, because one mistake can't be rectified. But actually I was beginning to enjoy this and understand why all the preparation was so important. Once I began to cut away the gaps between the leaves the shape and leaves began to emerge. Tom had said to me it's a bold design and you'll see some wonderful light and dark shadows when it's finished - and he was right. He must have done this sort of thing before I think! Time for lunch. Another sumptuous lunch, which included mmmmu cheese scones too, and back out into the afternoon's gloom to crack on, just 3 hours remaining to get it finished. 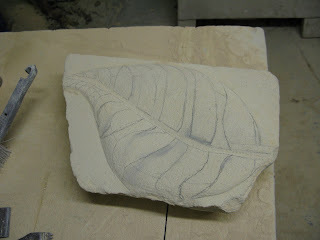 Discussions ensued to work out where to distress the stone to get the leaf to sit out from the background. In the end it was decided to distress the background, and that worked a treat. This was coming on lovely. Then Tom said, kick back the underside of the leaves, that'll give it a really sharp edge and shadow, very dramatic. 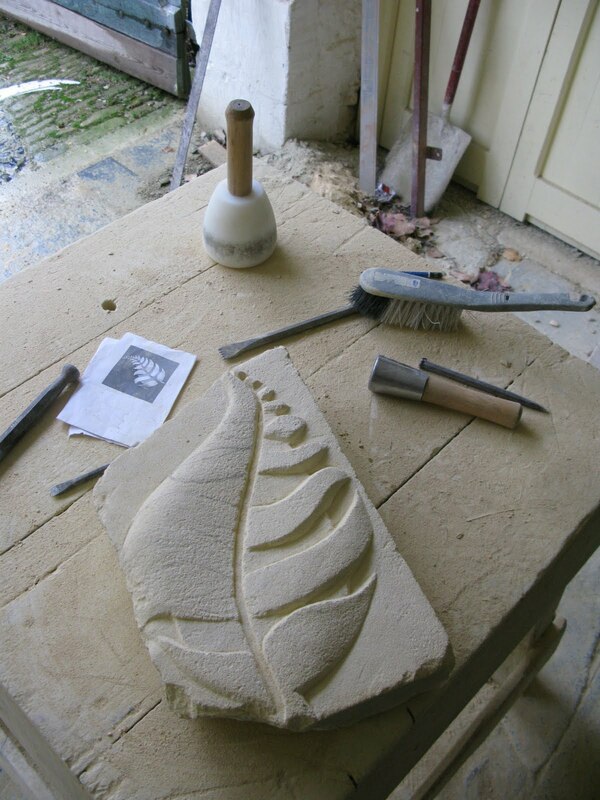 And what a difference just doing that little bit of undercutting to the bottom leaves did to the shape and strength of the piece. Fantastic. And then disaster...... in my enthusiasm, I tried to underscore the top leaves, which were nothing more than blobs of stone....TWO chipped away completely. It was now 4pm and I thought some rude words and called out for Tom. HELP!!!! Could we glue the bits back on? Well yes but it's never satisfactory. 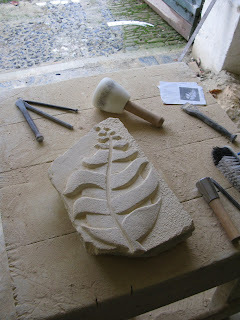 So he suggested filing the stone slightly to reduce the height of the remaining top leaves and see if that works. I began filing and thought, hey I know what, why don't I file the whole top of the leaf back to the bedrock stone and start again. Hopefully this means the top leaves will also bend away from the viewer. So that's what I did, and in 50 minutes rescued a disaster of a project, to produce what I have to say, even for myself, is a nice first attempt at stone carving. Mind you I'll never get those clothes clean again! I'm hooked, what a fantastic way to spend a wet and miserable November afternoon, much better than Christmas shopping or sitting in front of the telly and eating sweets. And now I'm away to pack up my house for the imminent move. I may not be blogging again until 2010, so in case not, Happy Christmas and Happy New Year! Just the briefest of notes to apologise for not being on the blog, so to speak, for the last few weeks. Work has taken me away a lot and I've also got my house on the market. 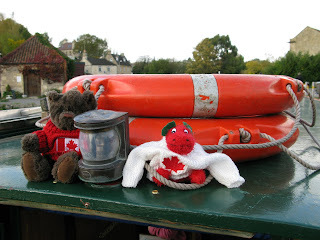 At the weekend I plan to post a summation of various things, in the meantime a brief hello to two friends of mine who joined myself and a friend on a canal trip recently!